Oswegatchie is a Snowshoe Paradise! Oswegatchie can handle 50 participants at a time on a snowshoe adventure. We have the ability to offer physically advanced hikes or easy going trips. We have 8 different sized shoes, so adults and children can all have a great experience. The only thing we do not control is the depth of snow! Intended for Grades K -12, program adjusts based on skill and ability of students. Oswegatchie uses primarily Atlas Snowshoes. Proper winter clothes are an essential part of a groups preparedness for a day outside. Bringing a water bottle is recommended. 3 Hour Snowshoe Adventure at Oswegatchie! We will climb tall hills and slide down the slopes. Groups will discover animal tracks and signs. Returning to our origin will take us along the pond's edge and under the trees. Teachers & chaperones are expected to snowshoe in order to manage the students. The snowshoe lasts about 2 - 3 hours, which includes getting snowshoes on, warm ups, a trek, rests on the trail, and returning to the starting point. 50 people max, minimum of 12 people. This adventure also focuses on winter ecology as we find tracks, homes, and evidence of animals in the forest. Any time we take a trip out, what we find is different. The winter snows paint a different picture for each trip. 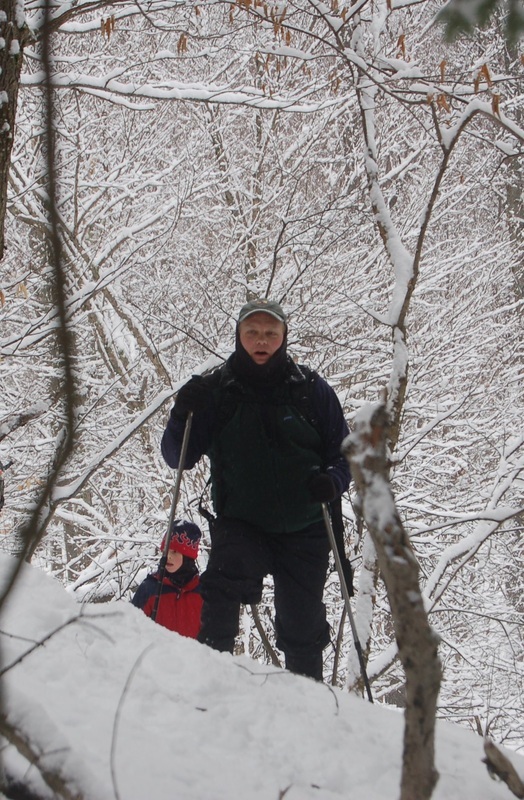 The 3 hour snowshoe adventure is $10 per person. The minimum group charge is for 12 people. Maximum number of people in snowshoes is 50. 6 Hour Team Building and Snowshoe Adventure at Oswegatchie! Oswegatchie staff are great at doing team building with groups of all ages. For the first half of the experience, a group will spend time doing "initiatives" that build bonds and trust. Depending on weather, this can be inside or outside. The team building component for this experience can be changed for winter ecology lessons. Anything from mammal adaptions to snow flake structures make for great learning opportunities. Warm space will be provided for a lunch break in one of our lodges. Groups are advise to bring their own lunches, but Oswegatchie can do meals for an additional fee. The 6 hour snowshoe adventure is $25 per person. The minimum group charge is for 12 people. Maximum number of people in snowshoes is 50.